Hey friends! 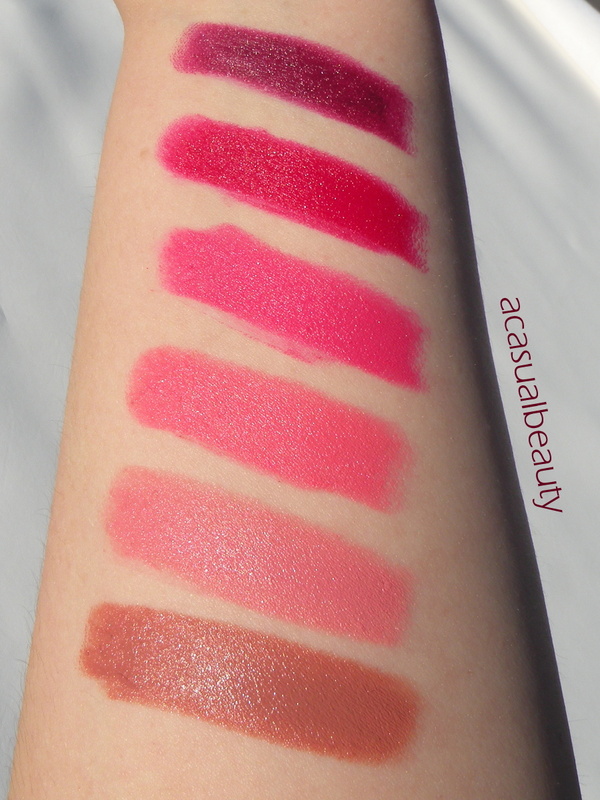 Today I wanted to share a review and swatches of some lipsticks from Wet N Wild. I have six shades from their Mega Last Lip Color line including Bare It All, Think Pink, Pinkerbell, Don’t Blink Pink, Cherry Picking, and Sugar Plum Fairy. 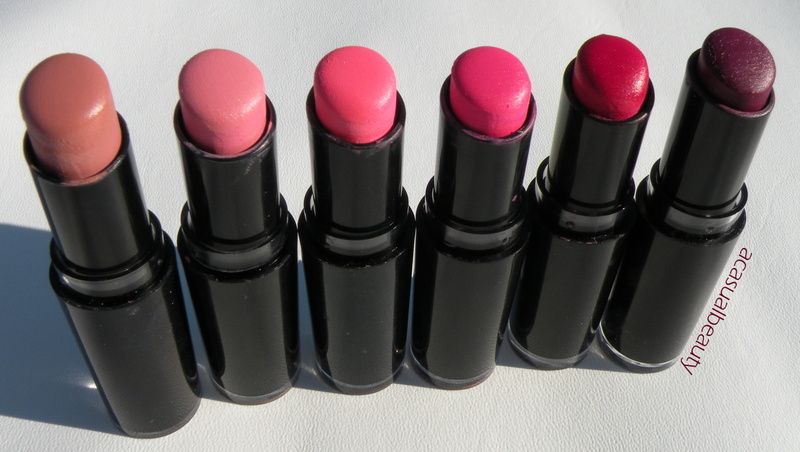 These lipsticks along with other Wet N Wild products can be found at a variety of stores and drug stores including Walmart, Walgreens, Rite Aid, CVS, etc., and they cost a mere $1.99! 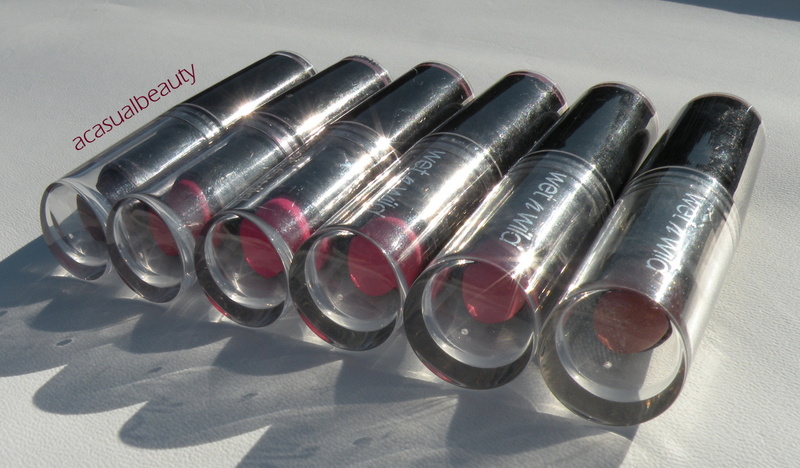 These lipsticks feature plastic packaging with a black base and clear top. The lipstick bullet is not fully covered by the tube when you twist the bullet down so be aware that it’s easy to hit the top of the product with the clear cap which can be messy. 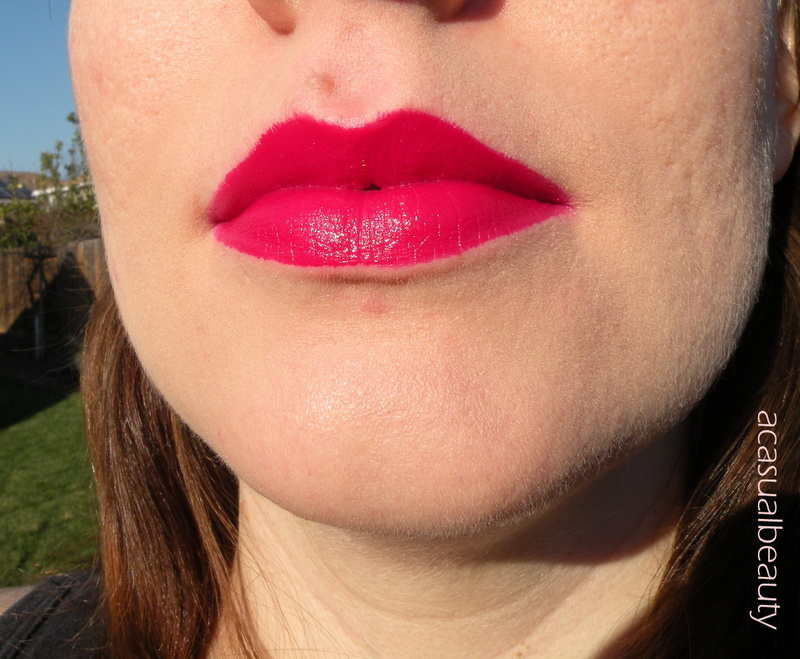 These lipsticks are very highly pigmented and opaque! It doesn’t take much work to build up the color. 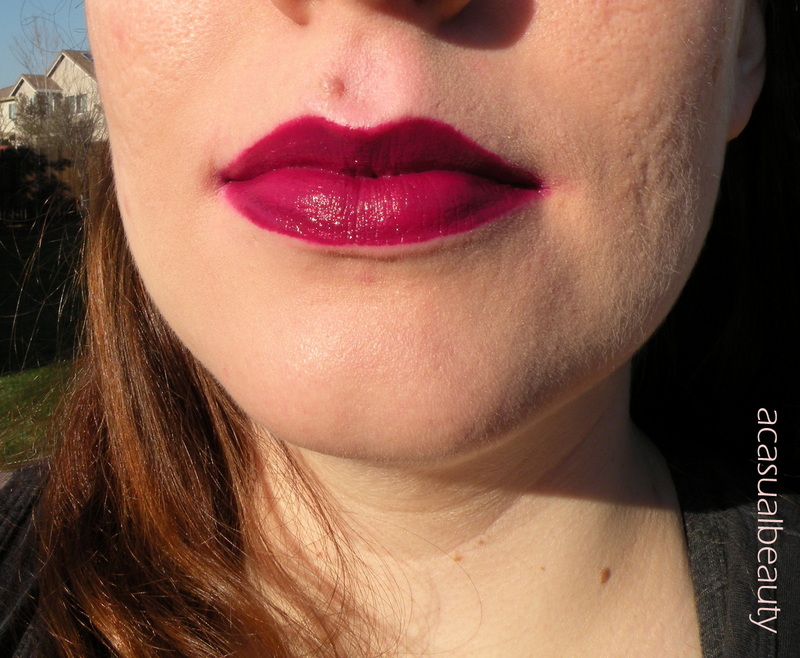 I’ve heard a lot of comments and reviews that talk about these lipsticks being matte, but I don’t find them to be truly matte. They have a bit of a sheen to them although there is no shimmer or glitter. Even the Wet N Wild website states that these lipsticks have a semi matte formula and creme finish so I’m not sure why I’ve heard so often that these are true mattes. 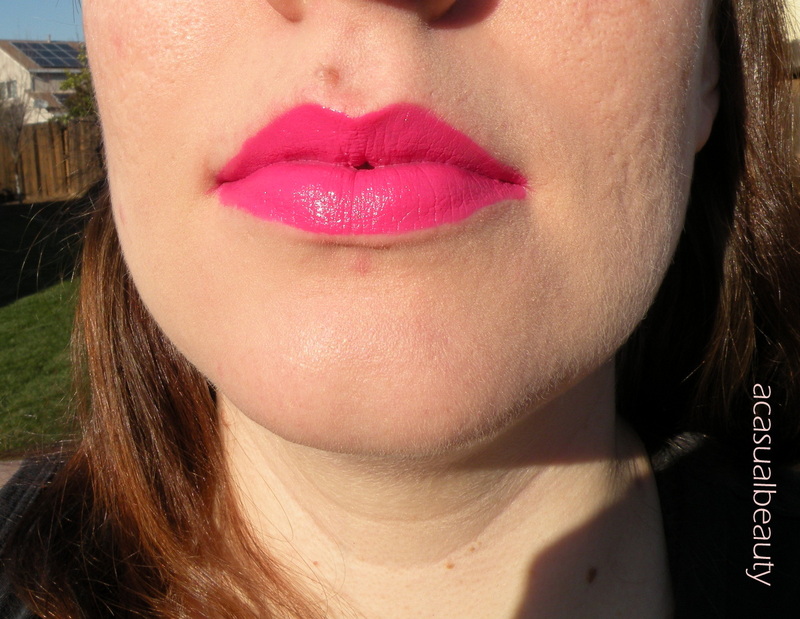 I don’t think these drag on the lips, but they aren’t the most creamy formula either. Even then I had no problems getting these to glide on pretty smoothly especially since they warm up as you make multiple passes on your lips. 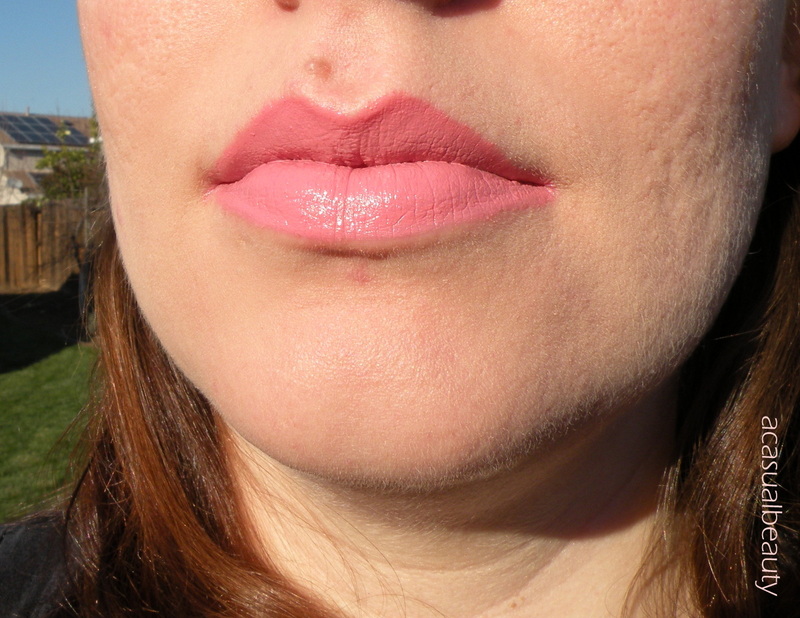 These are on the thicker side of lipstick formulas, and you’ll likely be able to feel them on your lips since they have a heavier feel overall. The thicker nature of the formula does help out with the longevity of these lipsticks which contributes to nice lasting power. These can be somewhat drying especially as you wear them throughout the day. I can see how they would stick to dry patches or flakiness on your lips so you’ll want to exfoliate and moisturize to counteract those qualities. You may want to wear a lip balm underneath or over top of the lipstick to help it feel lighter and more moisturizing on the lips. Also, I find that the darker shades leave a bright stain. Even with makeup wipes and cleanser, I still saw a noticeable bright pink stain on my lips after swatching these products. Overall, I think these are really nice, super affordable lip products. The thicker, somewhat dry feel of these may not be your cup of tea, but they also have nice lasting power and strong, opaque color payoff for an awesome price. Plus you can always manipulate the feel of these lipsticks by using balms and glosses for more moisturizing or stain like effects. I hope you enjoyed this post and that the swatches and photos below are helpful! 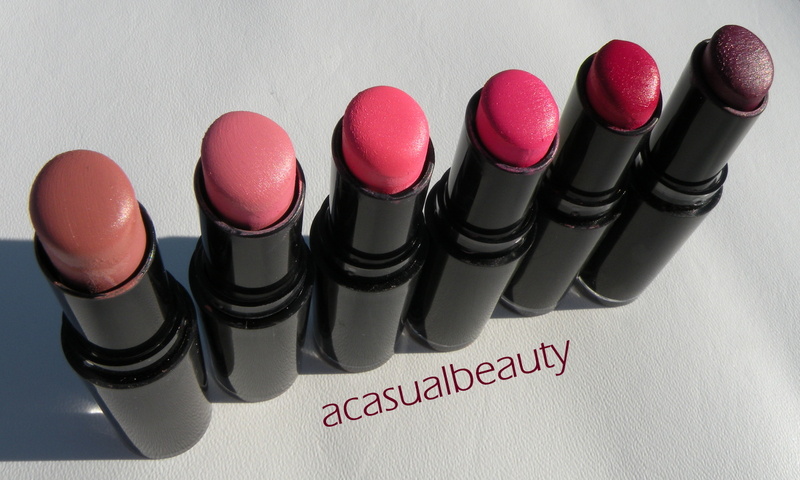 Let me know what you think about these lipsticks-have you tried them before? What are your opinions? Bare It All looks pretty on you. Strange I haven’t pick any wet n wild lipsticks before but will sure check them out. Thanks for sharing this post. It’s so weird to me that I haven’t tried this formula yet. What’s my excuse for under two bucks, right? Haha I know what you mean 🙂 Ive held off an a lot if cheap finds like this! haha great minds! I wrote my review on these on Sunday. I really liked them! I’m so surprised! 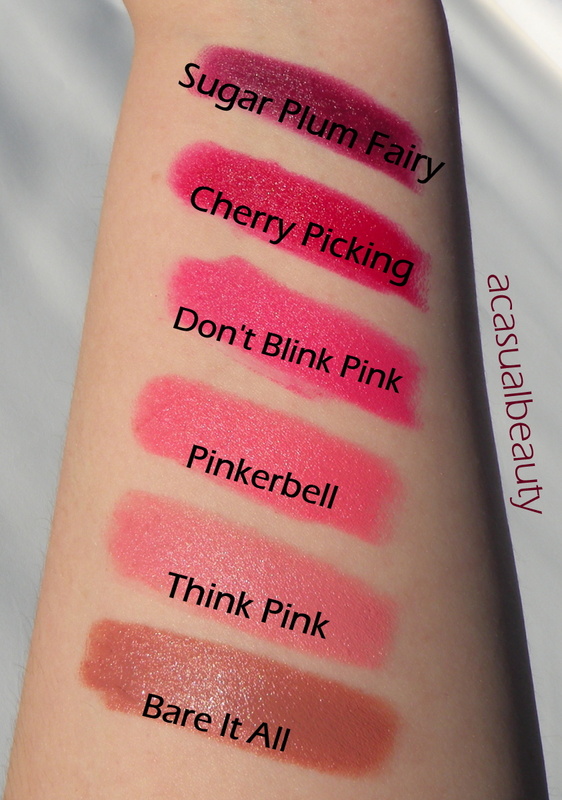 Loving the “Don’t Blink Pink” & “Cherry Picking” colors!! Thank you for swatting … Definitely going to have to try! I am such a huge fan of Wet N Wild products, I mean they’re dirt cheap and worse comes to worse you only lose a couple dollars=) Come check out my blog when you got time! Aw thanks and yours too!! Pinkerbell and Don’t Blink have me ready for summer already! Love those shades–great post!! 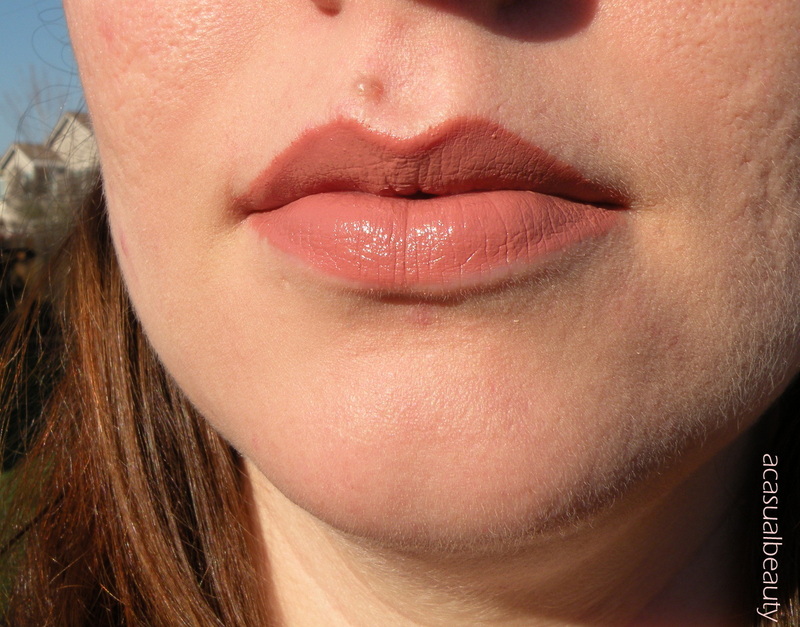 Bare it all is one of my favorite lipsticks lately! These really are such a good deal! They have crazy pigment and last forever. 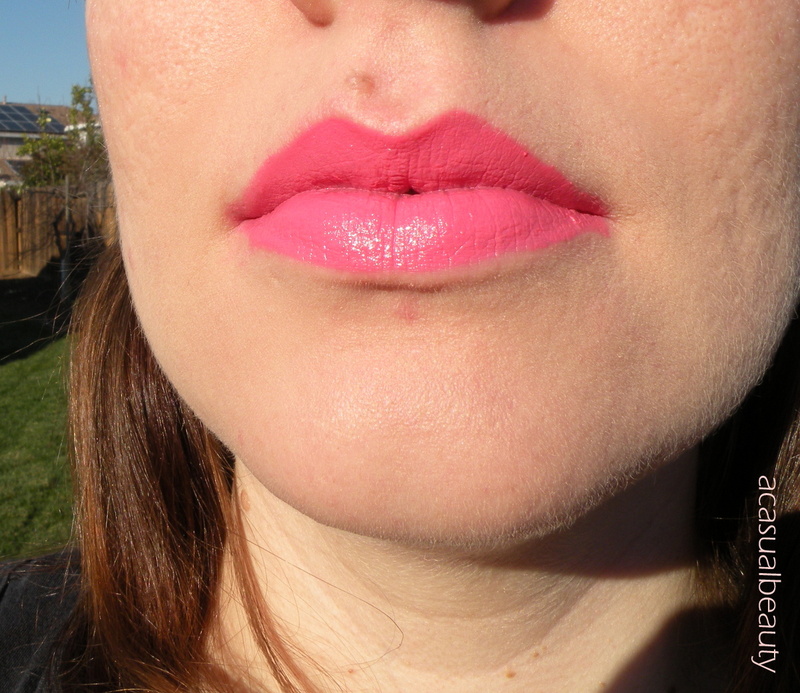 I do put a tiny bit of balm on my lips before I use them because they can be a teeny difficult to work with, but I don’t think that is a problem at all considering the cost and color payoff. Hmm I honestly dont have a great answer for that considering I often neglect lip products! Im not too attached to anything but I like a lot of NYXs lip options and probably their glosses since gloss is much easier to throw on than lipstick 🙂 How about you? Yes the NYX ones are great 🙂 My favourite so far is MAC – I love that they have such an extensive colour range with so many different finishes! I really like that one! I have heard that it is a dupe (at least in terms of color) for MAC’s Rebel….however I cant confirm that since I dont own any MAC 🙂 Thank you for stopping by!! PS: if the formula is thick and a bit dry, how they apply? patchy would be my first thought… what do you think? it takes a lot of effort or you can slap it on and you’re good to go? I don’t own any MAC mattes either so I know what you mean… But I can tell you that the NARS Lip Velvet pencils are really, really drying! even if the colours are beyond gorgeous! thank you for the helpful response lovely! love every single shade! I haven’t tried them but some of the shades really “tease” me… a lot! haha!